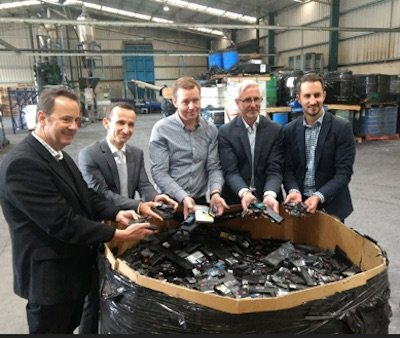 Australia’s first lithium battery recycling plant has been officially anointed in Victoria, in conjunction with the launch of $16.5 million state government e-waste processing plan. The plant, established in New Gisbourne by Victorian company Envirostream Australia, is the first in the nation to recycle lithium batteries – the now ubiquitous power source for mobile phones, tablets, electric cars and home energy storage systems. But while batteries – and in particular lithium batteries – are playing a central role in facilitating the world’s digital and clean energy revolutions, only 3 per cent of Australian batteries are currently recovered – the lowest rate in the OECD. Envirostream’s $2 million recycling facility, which began operations last year, is trying to change that. In 2017 alone, the plant recycled 240,000 kilograms of batteries that would otherwise have gone to landfill, or been shipped to China for processing. The facility’s official opening was attended by Victoria energy and environment minister Lily D’Ambrosio, who used the occasion to release details of a plan to ramp up the state’s recycling of electronic waste. Electronic waste – or e-waste – is defined as anything with a plug or battery that has come to the end of its useful life; including old mobile phones, computers, audio devices, refrigerators and other white goods, hair driers, TVs, heaters and air-conditioners. The amount of e-waste generated in Victoria is projected to increase from 109,000 tonnes in 2015 to approximately 256,000 tonnes in 2035. The plan, which is being rolled out by Sustainability Victoria, comes ahead of the impending state ban on sending e-waste to landfill, which takes effect on 1 July 2019. It includes $15 million in grants to help Victorian councils and state government entities upgrade infrastructure to collect e-waste at more than 130 sites. This will ensure that 98 per cent of Melburnians are within a 20-minute drive of an e-waste disposal point, and 98 per cent of regional Victorians are within a 30-minute drive of one. It will also include a $1.5 million awareness campaign to educate Victorians on recognising e-waste, how it should be managed, and the environmental and economic benefits of reusing, donating, repairing or recycling it. To Envirostream, Sustainability Victoria has extended a grant of $40,000 to go towards boosting the company’s recovery of valuable materials in lithium batteries. “As one of the country’s trailblazers in reprocessing electronic waste, it’s helping to keep valuable resources out of landfills,” said Sustainability Victoria CEO Stan Krpan. Envirostream Director, Andrew McKenzie, said recycling batteries at New Gisborne would create five new jobs over the next year and help build Victoria’s recycling capacity. “We’re in an increasingly mobile world. Lithium batteries are now the dominant mode of energy storage for domestic and industrial uses, and like other e-waste, their use is growing fast,” he said.